BUY & SELL ROCKET LEAGUE CARS HERE! Your favourite car may not be shown on this top 10 list at the time of viewing this post as Pysonix are constantly bringing out new cars. The road hog is one of the biggest and strongest cars in rocket league! Once unlocked Road Hog, it comes with 7 free skins for you to choose from. The Dominus GT can be won in the Champions crate 1 and the Player’s Choice crate 1. The Dominus GT is quite a flat car, meaning that dribbling and air hits feel much more controlled. The breakout can be unlocked by just playing games. I would advise using the breakout if you want practice on aerials as it allows you to control your aerials smoothly and it can make dribbling easier too! However, the Breakout doesn’t get much power on the ball. The Merc is like a huge tank that is the largest car in the game. It can be unlocked by also just playing games and it’s power is incredible! It is also good for demolitions, if you like to play that tactic! The Aftershock can be purchased in the showroom. It can generate a lot of power and it looks amazing!! The Dominus can also be purchased in the showroom. It is a simple car, similar to the breakout, but it can get a little bit more power than the breakout as it is a slightly taller car. The Dominus can be easily controlled when going up for aerials and you are able to dribble with the ball easier as it is a flat car. The Takumi car can be purchased in the rocket league showroom. 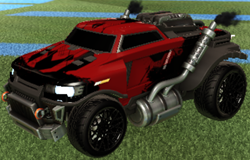 The Takumi is a battle car along with the Dominus. It is a slightly smaller car than the Dominus and has similar features to it. I have ranked the Takumi above the Dominus because in my opinion, the Takumi feels better when I play with it. The Batmobile is an incredible smooth car to use as it makes aerials more controlled and dribbling on top of your car much easier because it is so flat and long. In my opinion, the batmobile is the best car to do half flips. The Octane was used by the majority of the pro’s at the Rocket League Champion Series 2. The Octane is a good all round car: its fast, powerful and easy to get used to. The Octane ZSR is the brand new version of the Octane that Pysonix released recently. It has all the same features and similarities to the normal Octane, but it just looks cooler and is very slightly larger.